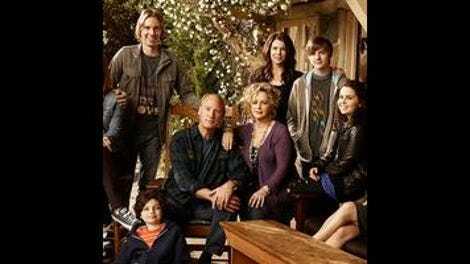 Parenthood: "Put Yourself Out There"
The thing about a show like Parenthood, a show squarely in the Herskovitz/Zwick school of turning small incidents and little life moments into the stuff of drama, is that you're always waiting for The Scene. You don't know when it's going to come. You know the show has been building to it, to that moment when two characters finally sit down and hash out what's on their mind. When that moment comes, well, it feels like an immense relief, like when you finally have a long talk you've been meaning to have with someone for quite a while. In all of the build-up, you'll be kind of tense and concerned, but when that talk is over, it will be like a huge weight lifting off of your shoulders. Maybe you and the person will finally be closer. Maybe you'll stop being friends. Maybe you'll fall in love. Who knows? But almost always, having the talk is better than not having it. The Scene is the small-scale drama version of that talk. It almost always involves a talk, yes, but the show in question will usually tease you along about when it's going to happen. The long, drawn-out process of doing this will sometimes last just an episode: We all knew that Crosby and Joel were eventually going to come to an argument over how Crosby was switching up Joel's precious "There's gold in them thar hills" play, and all it took was the running-time of the episode. (Seriously, the play hadn't even been brought up before this one.) Sometimes, this process can take the run of a season: We're obviously going to reach that scene where Adam and Sarah finally have it out over Gordon, but we're not. There. Yet. Which makes the waiting even worse. And sometimes, the process takes much, much longer: How long has it been since we wanted Camille and Zeek to speak a little more frankly about their marriage? And we finally get that tonight. The thing about Parenthood is that it, like the shows that inspired it, really believes that having the talk, that getting to The Scene, is a better thing than not having it. As Lenore from Hung tells Amber tonight, if you don't ask for something, how are you ever going to get it? People aren't mind readers, even the people in your own family, and until you step up and say, "Hey, I'd really like such and such," you're not going to get such and such, even if such and such is an entirely theoretical concept like "respect." I mentioned the Herskovitz and Zwick tradition above, and since my mom reads these and she'll have no clue what that means, I may as well clarify. Marshall Herskovitz and Ed Zwick were the forces behind four really terrific series that chronicled the American life in the '80s and '90s, across four decades of being alive, from your teens to your 40s. The four series were thirtysomething, My So-Called Life, Relativity, and Once and Again (in that order, chronologically), and just one of the writers the two discovered was a young man named Jason Katims, who worked on My So-Called Life, created Relativity, then went on to bomb around Hollywood for a few years before shepherding Friday Night Lights and Parenthood (both movie adaptations, weirdly) to the small screen. So those fingerprints are all over this show. thirtysomething, memorably, agonizingly drew a marriage to its very breaking point and then healed it back up again over the course of two seasons, two seasons filled with minutely drawn detail and contemplated affairs and moments when the characters just didn't know if their lives were worth it anymore inside of this … thing that was their marriage. Parenthood hasn't been QUITE that daring, but it also doesn't leave its issues buried deep beneath the Earth. It's been a while since we got back to Zeek and Camille's affairs, but they came up again tonight in an absolutely shattering plot that involved Camille ending up in a class with one of her former lovers. The anger and hurt in Bonnie Bedelia's voice when she learned that Zeek had gone to try to scare the teacher off was palpable, and it made up for the fact that the show hadn't really used her all that well this season. Another hallmark of this kind of show is using one version of The Scene to comment on another. Ever since Haddie met up with her new friend Alex (of TV's Michael B. Jordan fame), we've been waiting for her to confess her crush to another member of her family. What will they say about it? He's far from the normal type she would fall for, what with his "being older" and "having life experience" and also that whole thing about how he was a recovering alcoholic who shouldn't really be in a relationship right now? Yet, despite saying this, he continues to behave flirtatiously toward his young charge? (To the show's credit, it hasn't made Alex's race a thing, not yet at least.) Alex seems like a good guy, but he also seems to have some lack of boundary issues. So when Haddie confesses her crush to her grandmother, we're expecting her to say, "No! Terrible idea! Back away!" But the most interesting swirl of emotions runs across Bedelia's face, and we're suddenly faced with a woman who's questioning her marriage yet again, but wants to believe this young woman can find love. And so … she tacitly encourages it. It's a beautiful little scene, building off of what we saw before without bringing it up, and it's well played by the two actors. But all of the other storylines were clicking tonight, too. Instead of having Sarah get enormously upset about Gordon's friend, the show turned this into a "Sarah and Amber are friends" plot, and those plots almost always work. (I loved the scene where Sarah wasn't crying until she was.) Amber's lack of confidence in her own smarts and ability is undercut when she scores a 2250 on the SATs, leaving her a lot of options for the future, but she's scared to talk to Gordon's friend because this feels exactly like something she'd screw up. Except she doesn't. That's all there is to it, but the show's strength is making you feel all of the weight that goes behind the fact that she didn't screw it up. Similarly, the story where Kristina navigates a treacherous situation for both herself and Max is nicely done; in this case, it doesn't really hinge on Max's autism but, rather, on his sore loser complex, and it's a nice reversal of what we've been expecting. Look, it's enormously difficult to sustain a tone like this. And despite being a pretty good show, I don't think Parenthood's made that leap up to the next level that I hoped it would after last season very quickly got much tighter. It's not the second coming of the small-scale family soap I hoped it would be. And yet there's something very satisfying about it, all the same, something that makes it one of those shows I look forward to every week. I don't know how long Parenthood can keep up this trick of keeping the tiny, tiny stories seeming like the most important things in the world, but I think its heart is in the right place, and that means I'll follow it until it brings in a sweeps month car crash or something. I talked about this in the Glee review, but the way that Parenthood is building a little world is almost even more impressive. Forking over the dough for Minka Kelly when she mostly just sat there and watched two kids play? Impressive, but it helps us buy the show's world's internal consistency. I love the Joel and Crosby storylines, which are few and far between. This one was no different, and I like the way that Joel is presented as the super-competent parent and Crosby's just the guy who gets along really well with kids. The story's mostly left hanging, so we'll see how it all resolves itself at Thanksgiving dinner next week. "You know what takes a play that's kind of good to Broadway good?" "Harmonicas!" "We'll put the boring stuff back in too."